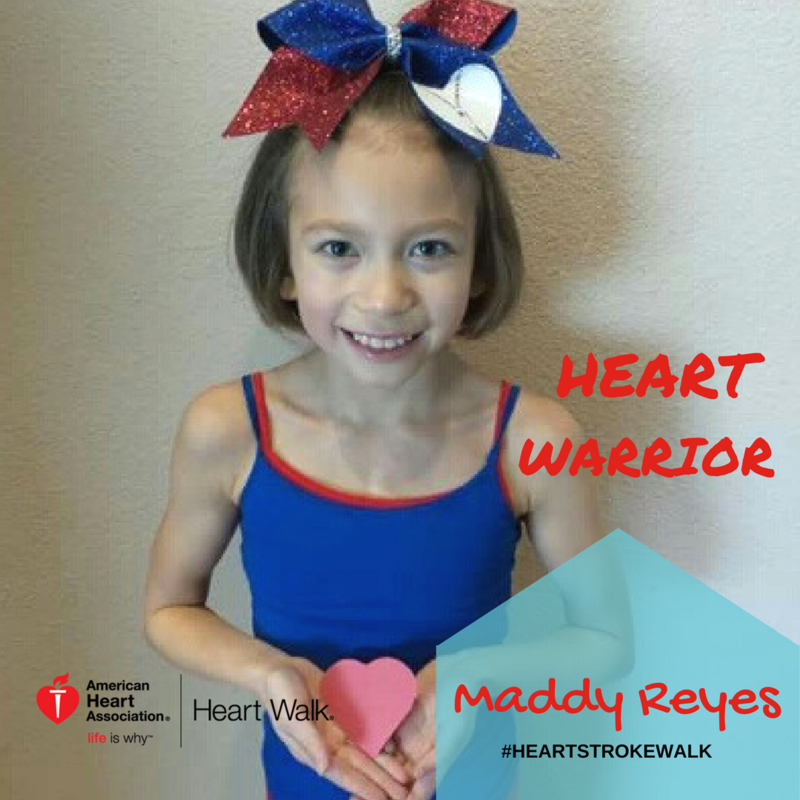 Maddy Reyes is a 12-year-old Heart Warrior participating in the 2016 Puget Sound Heart and Stroke Walk. She is also a social media ambassador, @MaddyGoCheer. I have a different heart than most kids. When I was born I was diagnosed with a heart condition called Tetralogy of Fallot. The doctors and surgeons were watching my heart very closely until I was four months old. When I was four months old my doctor told my parents that I would have to get open heart surgery to keep my heart safe. The surgeons fixed a hole in my heart and made my pulmonary artery bigger. My doctor is now watching my heart closely to see when I will need a new valve. When I get to an age when I need a valve transplant, I will need to have open heart surgery again but the doctors are trying to wait as long as possible until I have my next surgery. Every year I have to go to a children's hospital for checkups. My checkups are different than a normal checkup though. For a heart checkup you have to do a treadmill test which tells the doctors how fast my heart rate goes and what my endurance level is. Also there is an echocardiogram which shows the doctors how my heart is doing and the heartbeat. When you go they also have you do a sticker test when they put stickers on you with a bunch of wires to see your heart rate. Last but not least, my least favorite one is the MRI. During the MRI you have to get an IV because for the doctors to see your heart they put color in the IV to make a good picture so they can see the little details and in a MRI you have to stay really still and calm in a big long tube for an hour and a half. I am very healthy and do lots of physical activities even though I have a heart condition. I do competitive cheerleading almost every day of the week and I tumble, stunt, and jump. I also do dance four days a week and the kinds of dance I do are tap, jazz, and ballet. I also run a lot of races and am on the cross country team. I am glad to be where I am right now and continue to grow stronger as I get older. 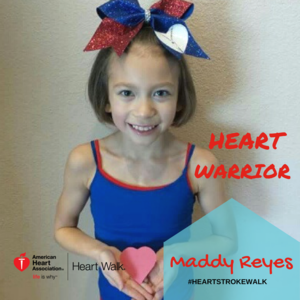 Leave an encourage note on Maddy's team page for the 2016 Puget Sound Heart and Stroke Walk. 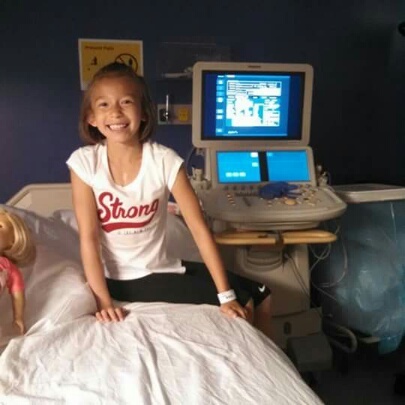 Maddy will be walking with family members and loved ones, as part of Team MaddyGoCheer.